As a writer, I was skeptical. 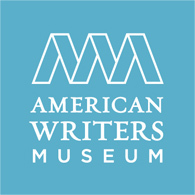 The American Writers Museum, which opened in May here in Chicago, says it’s all about “Celebrating American Writers Past & Present. The first museum of its kind in the nation!” Well, there’s only one exclamation point. They might know punctuation, at least. This museum is housed on the second floor of the Crain Communications Building downtown, 180 N. Michigan Ave., in an area frequented by tourists. Adult admission is $12; by comparison, the Field Museum costs $36 (but you can see Sue the T. Rex [not named after me]). What would you see at a writer museum? An animatronic guy typing? Because that’s what we writers do, we sit around and write. It turns out you can actually do that – write – at the American Writers Museum. There are cushy sofas and chairs, and pencils, pens, paper, and even old typewriters in working order sitting out to be used. And there are shelves of books if you’d rather read. The advertising says that “through dynamic state-of-the-art exhibitions” the museum “educates, provokes, and inspires visitors of all ages.” What it might actually do is encourage dedicated readers and writers to read and write even more. You enter through glass doors and pay at a desk in the midst of a small gift shop, turn right, and start your visit. When I came in July, a special exhibit called “Palm” celebrated poet W.S. Merwin and his palm garden in Hawaii. It tries to recreate the garden with real potted plants giving off the scent of wet earth and live greenery. Loudspeakers play outdoor sound effects and, if you push a button, you can hear poetry read aloud. Or you can read texts displayed on the walls. At one end of the long room, a desk with paper invites you to write your own poem, and Mr. Merwin will compost the paper and feed it to the palms: your poetry will have a guaranteed consumer. The museum gives you the sights, smells, and sounds of a garden. And a prompt: if it were the last day of your life, why would you plant a tree? American Voices, a 60-foot long presentation, is a “multilayered exhibit wall [that] takes visitors on a journey through the literary history of the United States. Trace the development of the American voice with the 100 emblematic and influential authors.” That exhibit faces a wall with 100 boxes showcasing selected works. Context saves this from superficiality: the exhibit details how writers and their works fit into US history, how authors’ inspirations and aspirations changed, and how a truly American approach to writing developed over time. I spent a while watching short videos about how Edgar Allan Poe’s “urban shock” stories led to a new kind of detective story and a new way to write about city life. I could have spent a lot more time investigating other writing topics with touch screens and moving exhibits. The museum seems small, but it has a lot to share. A temporary exhibit displayed the brittle, yellowed scroll Jack Kerouac used 60 years ago to type the novel On the Road. You can study his corrections and edits – and margin changes, since apparently the roll shifted sideways a bit as he continuously typed. The Readers Hall is just that: displays about books, shelves of books, and sofas and chairs. The Mind of a Writer area contains the aforementioned typewriters, pencils, and paper. You can write, post work on a story wall, and add to an online story of the day. In other parts of the museum, you can watch and listen to the hypnotic Word Waterfall, study writing techniques, and play writing games, such as an electronic form of poetry magnets. The museum ends with a display showing where writers and readers connected and still connect in Chicago, and information about the city’s iconic writers. Finally, there’s a small, writing-oriented gift shop. One thing that would make the museum better would be a coffee bar, but a sign warns: “No food and drink in the museum.” However, you can buy an American Writers Museum mug to take home. My visit held none of the boredom of watching a writer at work. I even learned a thing or two. I bought a little book of writing prompts on my way out, and chose a free bookmark. The museum holds regular events: a children’s author story time, workshops, and author readings and signings. In August, it will host a reception to induct Roger Ebert into the Chicago Literary Hall of Fame. Though small, the museum has a niche it aims to fill. I think it can do that.